This fourteen hour course is a part of the series of classes that include the Self-Defense Shooting and IDPA and Applied Self-Defense Shooting classes. It builds upon the basics and mechanics studied in the previous classes and introduces the information and skills necessary to defend your life under very low-light situations. Since statistics show that the majority of attacks occur in low light, it is necessary for the person who is serious about defending himself and his family to develop the ability to use a firearm in less than optimal lighting conditions. This class covers the use of regular sights and night sights as well as the proper use of a tactical flashlight. 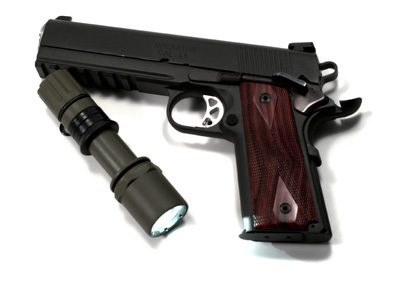 All popular methods for gripping a handgun while holding a flashlight will be covered. Special emphasis will be given to the grips that enable shooting on the move and shooting from cover. Practical-concealable hip holster (no small-of-back, fanny pack, or shoulder rigs). This holster must permit re-holstering with the use of ONLY one hand! (No soft nylon holsters.) Holsters with NO safety strap or retention system are strongly recommended. NOTE: We work closely with holster manufacturers and can help you select holsters and magazine pouches that are perfectly suited for this class as well as for competition and concealed carry. The class will conclude with a realistic home defense/street-fight scenario and will incorporate the skills taught in class. Your performance will be critiqued and you will have a second chance to run the same scenario. We are accepting names for classes that will be scheduled in the future. To get your name on the list, send us an e-mail with your contact information.